Understanding water rights in Colorado can be very complex. I have been working with Water Colorado on numerous deals since I started brokering water rights in 2002. Water Colorado has a great team with lots of experience in selling water rights and helping people to understand their water rights – definitely one of the pioneers in the field! Water is Colorado’s most precious resource. Despite its importance to landowners and consumers, water in Colorado is a public resource and its true ownership lies in the public domain. The right to use surface and ground water in Colorado has many of the attributes of private ownership of real property. Individuals and organizations in Colorado are allowed to buy, sell, and even rent water rights if the water will be put to beneficial use. Our goal at Water Colorado is to help you understand the intricacies and legalities of buying and selling Colorado water rights and what owning those rights entails. 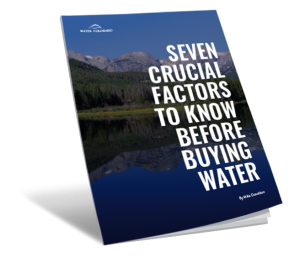 As water brokers, we can assist you in buying and selling water rights that are most suitable for your needs. We hope this website will become a resource for you to learn more about water rights and water laws in Colorado and to provide services to help you buy, sell, or rent Colorado water rights. If you have any questions about water rights, please contact us at Water Colorado.